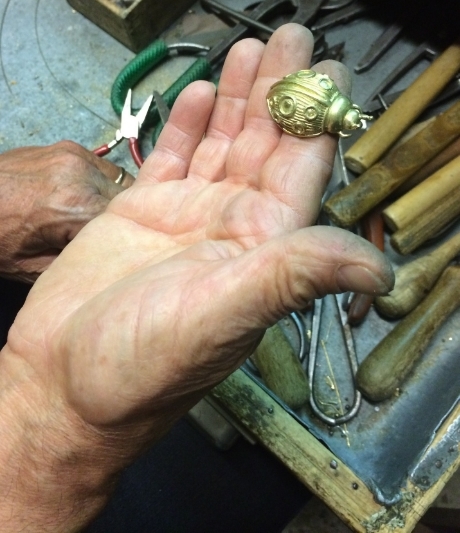 Giuliano begins creating all of his designs with brass. Then, each item is dipped in silver or gold in an electroplating bath. Giuliano uses pure silver (100%) and 18K gold. He is one of the few "smiths" left in Italy following in the tradition of Cellini, the Renaissance Master. Giuliano and Maria Ricchi in Florence Italy. Giuliano Ricchi was born in 1947, in Scarperia, a small medieval town in Tuscany. In 1962, at the age of 15, Giuliano began to apprentice with his master, Carlo Cecchi. He inherited not only skills and knowledge but also his "business know how." He honors his master teacher by keeping the original company name even after the passing of Mr. Cecchi. Guiliano is one of the few silver smiths remaining in Italy who designs and creates his masterpieces from beginning to end. He works in his studio in the Oltrarno section of his beloved Florence. He and his wife, Maria, prepare exquisite sterling silver and gold plated items for Gumps, European Royalty and The Best of Italia. Giuliano is a very enthusiastic and humble person who loves to show people his craft. He has been working for 52 years in the heart of the Florentine artisan's district. He deeply loves his work and feels honored that it is sought out by well known companies and brands, all over the world. Giuliano Ricchi providing a tour of his studio in Florence. The "laboratorio" where Giuliano creates his items of silver and gold with a combination of ancient and modern equipment. The Master's hands at work. Colorful gold and silver items from the studio.